When to Visit Cinque Terre. Ligurian Weather in April and May. A Practical Travel Guide. What's the Weather Like in Cinque Terre & What to Pack? Few decisions in life are this easy: Visit Liguria and Cinque Terre in spring. But only if you'd like to explore Liguria when there are almost no crowds, when the weather is good, and full services are available. Let's be specific: come after April 15 and before June 8*. The Portofino peninsula, Lerici and Portovenere, Cinque Terre, Camogli, Albenga, San Remo - all will have nearly full services, but with almost no congestion. The only exceptions would be crowding in the resorts around Easter and May Day and a hot weekend, as well as mid-day in the Cinque Terre trains and villages . While it's true that the beach-oriented resorts will be nearly empty unless it's hot, especially during the week, to us the benefits far outweigh the drawbacks. If your goal is hiking Mediterranean hills, seeing Ligurian hill towns, exploring architectural monuments, walking country roads, advanced Italian watching or photographing Liguria's trompe l'oeil, then spring is just the time for you. See our story listing at the end of this article. Ligurian flower in Spring. 3rd week of April. Ligurian Weather. So what's the weather really like in Liguria in April and May? You've read the weather summaries, but those are just numbers. In the first half of April, it's nice enough, but it tends to be a bit chilly and there's a moderate chance of rain. 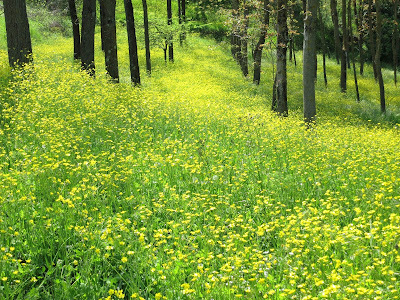 The second half of April is very pleasant, and along the coast and the nearby hills, up to about 2,000 feet of altitude, the flowers are out, the grass is green, and most species of trees have good sized leaves. There is still a chance of rain, but you are unlikely to encounter all day rain. The weather in May would be suitable for the Garden of Eden (except if Adam and Eve wants to sunbathe absolutely every day). This post is illustrated entirely with photos taken in coastal areas from April 18 to 24. We have written these special guides to help you choose a base town for your visit. Your clicks will help support our efforts to help travelers like you. Thanks. Rapallo, Santa Margherita, Portofino, Camogli, Recco. Towns on the perfect Portofino Peninsula. Flower with a view of the Gulf of the Poets. Holiday Schedule. You will want to be aware of Italian holidays when you're planning your trip. Easter draws a lot of vacationers to Liguria, especially if it's in warmer weather, so reservations are seriously recommended. (Easter dates are below). 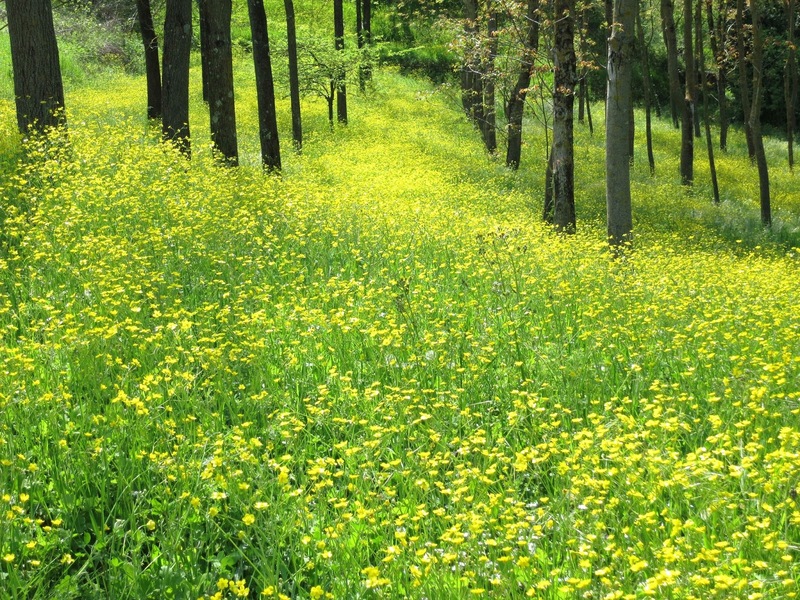 Similarly, May Day, on the 1st, is a big holiday and will bring many travellers on the adjacent weekend. Liberation Day, April 25, is usually not a big deal, nor is Festa della Reppublica, June 2 unless they fall on a Friday or Monday and the forecast is for good weather. On holidays - like Sundays - restaurants are not a problem, but banks and most stores will generally be closed - however grocery stores may be open in the morning in many areas. Transportation will run on a Sunday schedule. There are generally no parades, large ceremonies, or street closings associated with any of these holidays. Plan Ahead It's hard to do travel research when you are on the road so it makes sense to investigate Liguria's many attractions suitable for rainy weather. Genoa has a Museum of the Sea, an Aquarium, and its Nuova Strada museums are world class. See The Museums of Genoa Overview. La Spezia - near Cinque Terre - has an excellent Naval Museum, as well as art, religious, and ethnographic museums. See our article Ten Things to Do in La Spezia. There are well-known caves in Liguria Ponente, and Chiavari's classy shops are mostly in street arcades. There's a pasta museum, an olive museum, and a zillion churches with famous artworks. Plan ahead for the odd rainy day, and you won't fret about it. Numbers Here are historic air and water temperatures and rainfall totals to help you make decisions about your spring visit. Extra credit: convert Centigrade degrees to Fahrenheit in your head. Double the C temperature, take away 10%, and add 32. Example: 20C doubles to 40 less 10% it becomes 36 and when 32 is added, you end with 68F. We advise getting your car from one of the companies with the fewest problems reported (Avis, Europcar, Hertz, Autovia, Budget) either direct or via a reputable car rental broker such as AutoEurope. We hope you will make your reservation through these links -using the links do not raise your price. 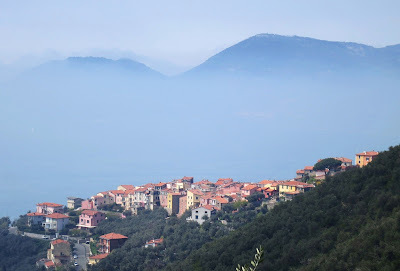 The village of Serra (SP) with an early fog from the Gulf of the Poets. Should I pack a raincoat? We carry decent-looking lightweight waterproof jackets that double as wind breakers. Should I bring an umbrella?Only a mini, but don't buy it special - sidewalk vendors are faster than rain clouds. What do I bring for warmth? A fleece jacket or vest that fits under the windbreaker. Should I pack a bathing suit? Only for sunbathing or wading, the water is still chilly. Should I bring a sun hat? Yes. Should I bring sunscreen? Yes, but you can buy it in Italy easily. When Should I Go? Visit the Cinque Terre only when the weather is good - they are all about the sea and the hills as well as the villages. First choice: April 15 - June 10; Second Choice: September 1 - October 10. Should I bring guidebooks? Definitely, it's hard to find guides in English in Italy. For a guidebook dedicated to Cinque Terre, the best by far is Pocket Cinque Terre Rick Steves (Amazon US) (Amazon UK) (Kindle UK). Most all of the Pocket Cinque Terre info is also included in Italy Rick Steves 2019 (Amazon US) (Amazon UK) (UK Kindle Store) which is Amazon’s best selling Italy guidebook. Should I bring a road map? We think it's easier to arrive with one. For driving get 1:200,000 scale. Look for DeAgostini, Touring Club Italiano or Michelin. Touring Club Liguria Map Touring Club Tuscany Map. You can also buy one in Italy - larger bookstores and a few autostrada rest stops have good selections. What will I forget? Remember medicine, credit and debit cards, and a passport valid for at least 90 days and you're done - it's easier to buy things than to pack for every possibility. If you are driving, you need an International Driver's Permit if your license is not from an EU state. In the US, get it from AAA, in Canada, the CAA. Where can I get questions answered? For Cinque Terre, we wrote the category killer: Every Answer You Need for Your Cinque Terre Trip. Also look below for helpful articles on other subjects. Especially for train questions go to the Trip Advisor Liguria Forum or for friendly experts Rick Steves Italy Forum. For many useful articles about visiting Italy, use the search box on Martha's Italy (a different Martha). Should I opt for a GPS for a rental car? No. Besides the expense, there are better alternatives. Use Google Maps or the Waze App on a smart phone. If you won't have cell data, download a Google Map of the area for offline use on a smartphone - it works w/o a connection through the phone's GPS. Which Airport is Closest to Cinque Terre? Pisa airport is the easiest as it's connected to Pisa's Centrale train station by a special train (PisaMover). Genoa airport is next easiest as there's a frequent bus (Volabus) to Genoa's Brignole train station (also stops at Principe station). Written by Martha and Mike. We are retired photo editors from Boston. 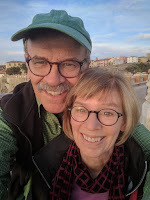 We have had an apartment in Liguria for almost 30 years. If you find an error or omission please let us know. When planning your trip remember there are no right choices, just different pleasures. Buon Viaggio. Tree farm in the 3rd week of April in Versilia, just south of Liguria. * The Italian school term ends starting around June 8, and hotter weather becomes more likely.